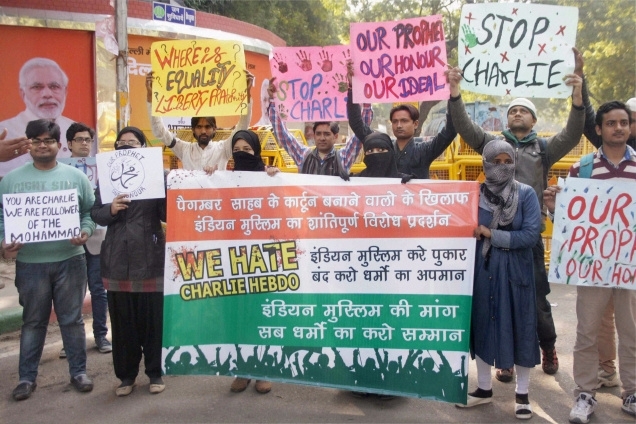 Members of the Muslim community protest against the satirical content of the French magazine Charlie Hebdo at Jantar Mantar in New Delhi on January 31. Press Trust of India. MUMBAI, India — The Charlie Hebdo slaughter in Paris has reverberated into the multireligious ethnic sprawl of Mumbai, where an Urdu newspaper has closed and its editor faces charges and death threats for having reprinted a cartoon of the Prophet Muhammad from the satirical French weekly. The prosecution of the editor, Shirin Dalvi, has focused attention on limits of freedom of the press in India, where news coverage often conflicts with the government’s efforts to protect religious groups from insult and disrespect. All the employees of the daily newspaper, Avadhnama, were dismissed in the days after Jan. 17, when it published a 2006 cover from Charlie Hebdo showing Muhammad weeping. That image was part of the newspaper’s coverage of the aftermath of the deadly assault on Charlie Hebdo’s Paris offices on Jan. 7 by Islamist militants, who said they were avenging Muslims offended by the French newspaper’s cartoons. Ms. Dalvi was arrested on Jan. 28. She has been out on bail, but is in hiding because of threats against her. At the urging of Urdu Patrakar Sangh, an association of Urdu-language journalists in Mumbai, five police complaints against Ms. Dalvi were filed from precincts across the city on the day her newspaper published the cartoon. “You are free to write anything in our country, but you are not free to hurt religious sentiments,” said Nusrat Ali, a reporter with an Urdu weekly who was among those filing the complaints. In the tussle between press freedom and religion in India, religion has often prevailed. India falls among the lowest countries on the World Press Freedom Index, a ranking compiled by Reporters Without Borders, an advocacy group. Authors, publishers, editors and filmmakers have often been censored over concerns that their work might provoke religious tensions. India was among the first nations to ban Salman Rushdie’s novel “The Satanic Verses” for fear of offending Muslims. Last year, pressure by Dinanath Batra, a Hindu activist, persuaded Penguin Books India to withdraw and destroy copies of “The Hindus: An Alternative History,” by Wendy Doniger, an American scholar. Mihir Desai, Ms. Dalvi’s lawyer, said that since the cartoon of Muhammad was freely available on the Internet, arresting Ms. Dalvi for publishing it was impinging on her freedom of speech. He said the government had the right to block the cartoon online and confiscate the publication, but had not taken either step. Ms. Dalvi said that she had used the illustration to accompany an article about the increase in Charlie Hebdo’s circulation after the attack in Paris. “It was not my intention to showcase the cartoons themselves. It was relevant to the story,” Ms. Dalvi said. After the cartoon publication created an uproar, Ms. Dalvi published a front-page apology asking forgiveness from the Muslim community. She also wrote in an editorial that she believed Charlie Hebdo was in the wrong for publishing provocative cartoons but that Muslims should respond with knowledge and wisdom. Ms. Dalvi said she has been harassed in the weeks since the newspaper stopped publishing. Fearing violence, she has moved out of her home in Mumbai’s Mumbra neighborhood, a Muslim-dominated area, and was staying with friends in different parts of the city. She said she had not been able to meet her two children, who have moved to a relative’s house and have been unable to attend school. Ms. Dalvi said that part of the harassment may be based on her success in the male-dominated field of Urdu-language journalism. She had been the only female editor of an Urdu daily. Some other prominent journalists have come to her defense. “Shireen Dalvi is that rare voice that liberal Muslims must ensure is not silenced,” wrote Vaishna Roy, a columnist for The Hindu, an English-language daily. Published online, The New York Times; February 15, 2015.